Mechanicsburg’s Wade Smiddy turns upfield after catching a pass near the sideline Friday against Catholic Central. MECHANICSBURG – Catholic Central provided a bit of early resistance, but unbeaten Mechanicsburg pulled away and blew out the Irish, 41-0, for an Indians’ homecoming win. The Indians (7-0, 4-0) opened up the scoring with seconds left in the first quarter with a 37-yard pass from Kaleb Romero to Phil Cook. The Indians extended the lead in the second quarter, pulling ahead to a 28-0 halftime lead behind another touchdown pass from Romero to Cook from 38 yards away and a pair of scoring runs by Romero. “Our kids are very mature and very intelligent, and we figured out some of their weaknesses and what they were doing and kind of exploited it,” Forrest said. It was more of the same after intermission, with Romero scoring on a huge 73-yard run which activated the running clock. Cook scored another touchdown before the third quarter ended, with M’burg putting in the reserve players to finish out the game. 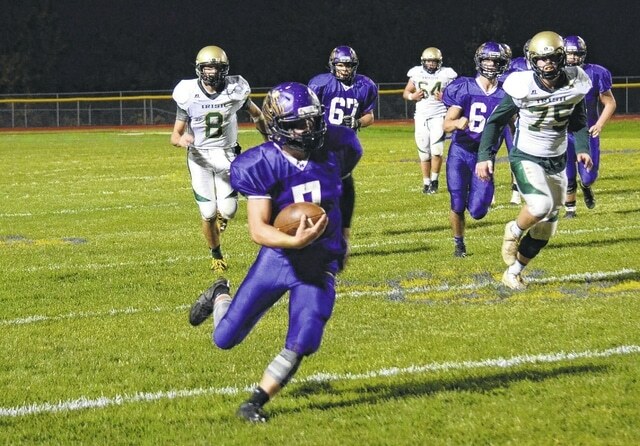 A trio of interceptions by the reserve secondary ended Irish drives and the boys in purple held on for the victory despite almost no offensive production after the starters left. Romero finished 10-of-10 passing for 217 yards and a pair of touchdowns while also running for 155 yards and three scores. Mechanicsburg outgained Catholic Central, 399-42, on the night, averaging more than 10 yards per play. The Indians play at Northeastern next Friday night in a continuing quest for perfection. https://www.urbanacitizen.com/wp-content/uploads/sites/36/2015/10/web1_Smiddy100915.jpgMechanicsburg’s Wade Smiddy turns upfield after catching a pass near the sideline Friday against Catholic Central.